Below you will find a small summary of what we do and who we are at Het Bonte Huis. HET BONTE HUIS is a small-scale childcare centre for children aged between 20 months and 4 years. It is open daily from 08.00 – 18.00 and is located on the Donkere Spaarne in the heart of Haarlem. The space is both calm and inviting to children and there is outside space with a sandpit, slide, hanging seat and a couple of rabbits and the smallest chickens you are likely to encounter! 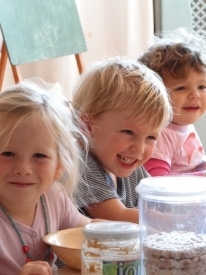 The Bonte Huis is the only childcare centre in Haarlem that works with one small group. There are never more than 7 children in the group at any one time. Children can attend for both full and/or half days depending on the needs of your family. There is plenty of time and space for creativity, individuality and independence. Nature and the seasons play an important role in The Bonte House and this is reflected in the books, the toys (which are primarily unformed and made from natural materials), and the activities that are on offer and the ever-changing window scenes and sensory table. Barbara takes ideas from both Antroposophy and Reggio Emilia and adds her own love and experience to create an environment where children feel safe and understood, where they can be creative and a whole lot more. The group is a vertical (mixed age) group with a maximum of 7 children ranging from 20 months to 4 years. The monthly payments are based on an average monthly cost for childcare. There is no charge for holidays (5 weeks in total). Below you will find a detailed explanation of the payment. The example is based on 1 child attending 1whole day session (10 hours) per week. Invoices are to be paid made monthly in advance via direct debit. There is no charge for the holiday period but public holidays are charged for. If holiday is taken outside of Bonte Huis holidays the full price will be charged. If a child is ill the full price will be charged. However these days may be taken in lieu provided they are done within 1 month of the holiday/ illness. On our internal site you will find more detailed information about Het Bonte Huis. As soon as your son/daughter has a confirmed placement you will receive the username and password for this site.